Wash, trim, then dice enough tomatoes to fit your Dutch oven. Here’s a no-recipe recipe for folks with little time and large palates. Tomato sauces are great to have hanging out in the fridge for impromptu meals. With their high acidic content, they have a lengthy refrigerated shelf-life, at the ready for spooning over, or incorporating into, grain dishes and proteins. 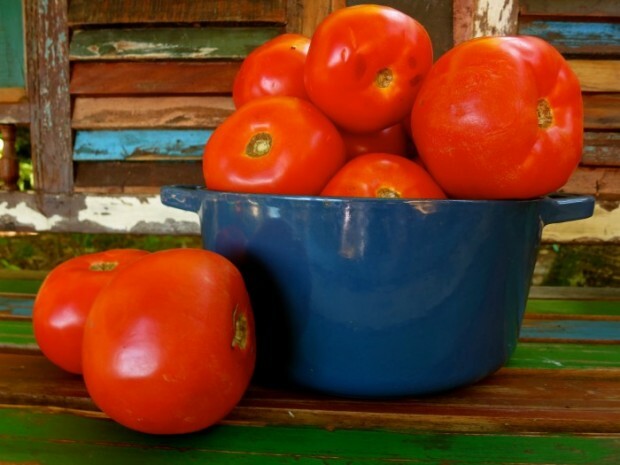 The best bottled, freshest tasting tomato sauces, however, can be pricey. Stir in olive oil, Kosher salt, wine and garlic, if using. So come September – when I can purchase local, off-the-vine tomatoes for a song – I make tomato sauce by the gallon, freezing it in small batches. I use to grow my own tomatoes, but now purchase them from local farmers for less money than it costs for me to “raise” them from seedlings. Think about it: plants, fertilizer, water, stakes…the plague of possible infestation? Rewarding, yes, but for the past few busy summers, not worth my efforts. 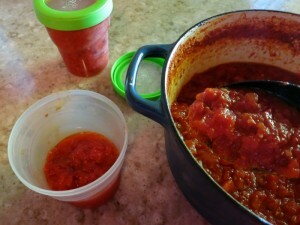 My mother made her own tomato sauce too, but her version took three times as long to make as mine. 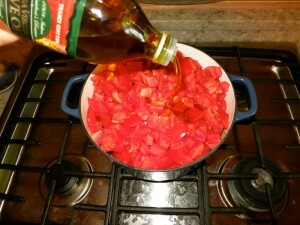 She’d place the tomatoes, each cut with a X, one by one into boiling water for a few seconds to loosen the skins. Then, with the precision of a surgeon, she’d slide off their casings. Then, bless her heart, she’d seed them, make her sauce, then ladle it into sterilized bell jars. Simmer several hours,stirring occasionally, until reduced to desired consistency. Canning? Forget about it. Ball Jar also makes a plastic container for the freezer. In lieu of those, I use yogurt containers, avoiding potential freezer burn by encasing them in freezer zip-locks. Skinning? Do I really have the time, and seriously, do those tiny bits of skin justify the effort it takes? Nah. I dice my tomatoes small enough so the skins aren’t large. I even like their texture incorporated into the silkiness of the tomatoes. If I didn’t, I’d run them through my food processor after cooking them down. I’ve included a recipe for my sauce below, but basically, all you do is dice enough tomatoes to fill an enameled cast-iron Dutch oven, stir in olive oil and kosher salt and simmer for hours. There are a lot of optional extras in the recipe below, but here’s the hitch: You should use an enameled cast iron Dutch oven to cook your sauce. The acidity of the tomatoes will react with an aluminum or stainless steel pot to lend a metallic flavor to the final product. Really. Been there. Package in plastic containers and freeze. 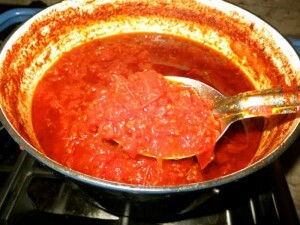 I will surely use this sauce base for quickie winter Bouillabaisse’s and Cioppino’s. Especially festive recipes for entertaining during the busy holidays – feeling the breath of September in the chill of December. Tips: ♥ If you’ve a Trader Joe’s in your area, I recommend purchasing their Greek Kalamata Extra Virgin Olive Oil or their President’s Reserve Italian. Italian friends (with vineyards) have informed me that Trader Joe’s purchases first class oils, yet we don’t pay first class prices. The long simmer obliterates the nuances of Maserati extra virgins. ♥ When I’ve leftover wine, I freeze it. Certainly not to drink, but to use in sauces such as this. Or if you’ve a bottle of red that’s been out a few days, that would be a good candidate for the sauce. ♥ By the way, you know not to ever, ever refrigerate tomatoes, right? 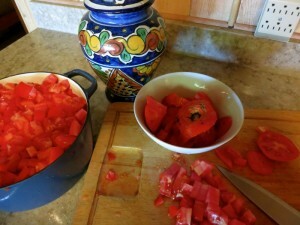 With a sharp knife, carve out stem end and slice off bottom end of each tomato. Cut into 1/2-inch diced pieces. When sauce is room temperature, stir in basil, if using. Spoon into containers (see above notes) and freeze.